Here you can find the possible variations and compose your own personal exqusite wooden stick. The Foresters rifle stick consists of two legs that are joined with a bolt in the upper end and usally two pairs of magnets, keeping the legs together. 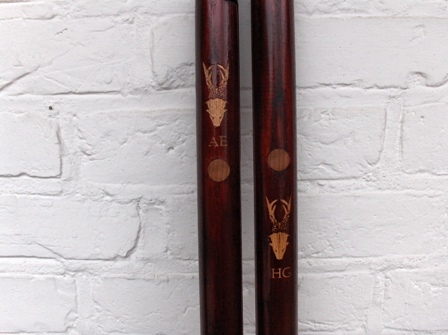 We will also produce the traditionel one legged rifle sticks / Monopods upon request You can have a piece from an antler at the top. See Monopods and walking sticks. 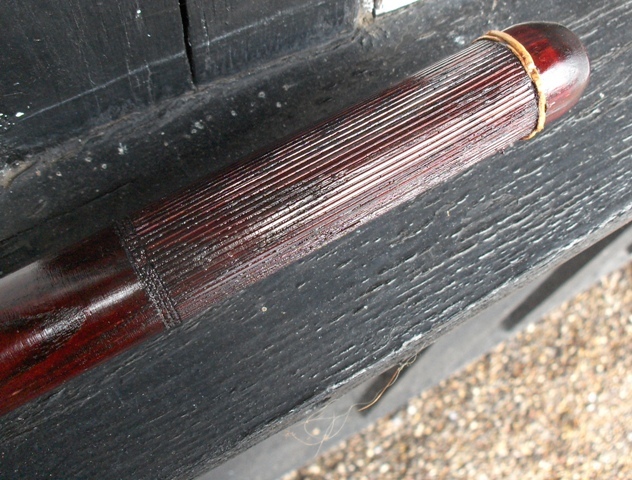 The rifle stick comes in two standard colours: Mahogany and green. These darker colours are often preferred by hunters. It is however possible to choose between many other colours. The green colour is darker an milder than the green colours of the colour chart. Mahogany nr. 83, is the colour in the bottom of the second row from the left. Remember that the animals would not see the red-brown Mahogany as well as you do. Therefore it could be a wiser choice than a green one. You can however also get it with camouflage pattern. It costs a little extra. 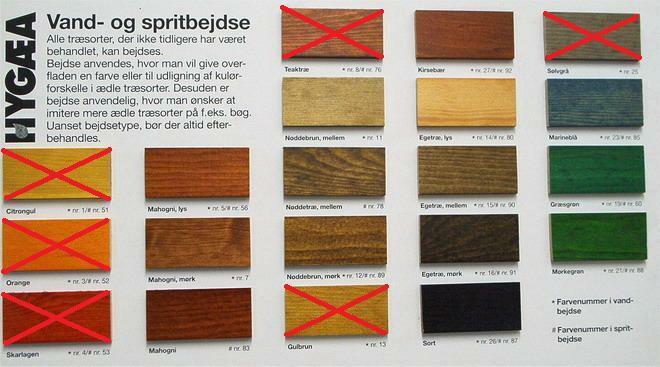 It is possible to order a bipod in nature wood without staining and only treated with Rustik oil or you can choose from the colour chart. Please ask for an offer if you have any special colour in mind besides the two standard colours. A rifle stick made of Ash weights approximately 730 gram (25,75 oz). The diameter is about 28 mm. (1,10 in). When the game moves you can follow with the rifle without moving the stick. It will twist. 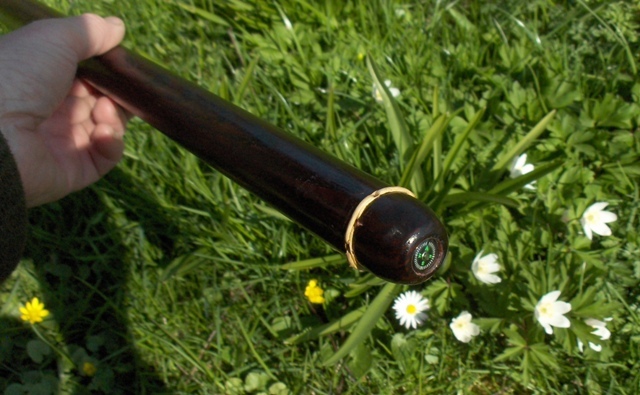 With a long ash wood stick you can twist approximately 20 m out of 100 m or ca. 11°. Ash is sustainable against scratches and blows. The ash comes from Denmark and is of the best quality with high density, many growth rings and branchless or clean-boled. As less than 3 % of our customers demand pine, we have decided only to use ash in our production for the future. It is important that the length of the rifle stick suits the user. The distance between the nose and the ground is equal to the best length. If you hunt in mountain areas you should considerate a special stick that at least has your own length. The diameter is about 28 mm. If you are left handed you probably shoot from your left shoulder. Please remember to specify if you want a left handed rifle stick. It is easier to open with your right hand. Initials, date and year can be engraved into the stick on your request. 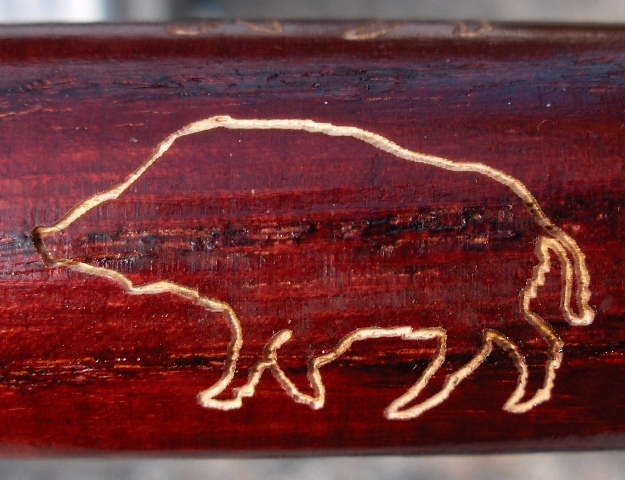 Laser engraving is a technique where a digital picture is burnt into the surface. The picture can be a logo, text or a drawing. Afterwards one can eventually fill out the engraving with colour - metal colours as silver and gold can also be done. We can assist with a working drawing and digitalizing. The engraving can be done on either the flat inside or the convex outside. See more pictures with laser engravings. This is what it can look like when it is finished! Please notice, that it can be necessarily to move the engraving contradictory to what have been agreed upon due to grain in the wood. There may be darker grains in the engraving, because we can not in advance be sure of how deep the grains are or on which depth they occur. 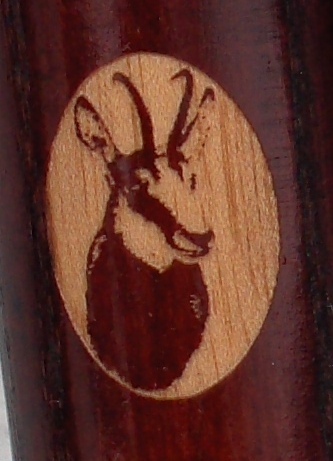 You can have a laser engraving on your rifle stick of these roe buck antlers! They are drawn by Truls Wiberg. The contrast will be best and most beautiful if you choose a very dark rifle stick. 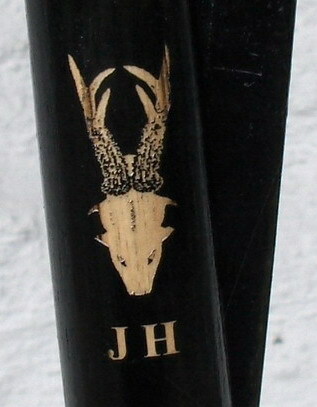 The two antlers to the right are narrower and fits on the convex outside of the rifle stick. Or would you perhaps want a boar? In the Alps lives the desired Chamois and the hunter has to have strong legs and be in a good condition. You can have it laser engraved on your stick. Woodcock. The engraving is made rather small. 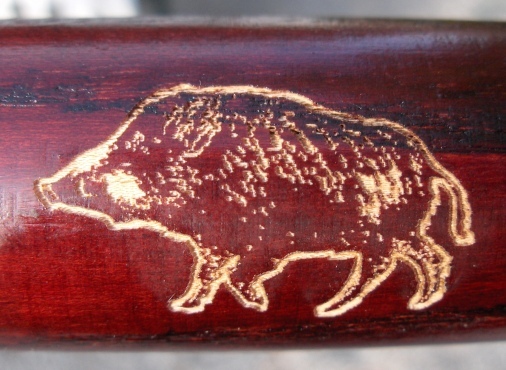 You can order a grip with checkering lines on the rifle stick. We make the grip with lines parallel to the grains . 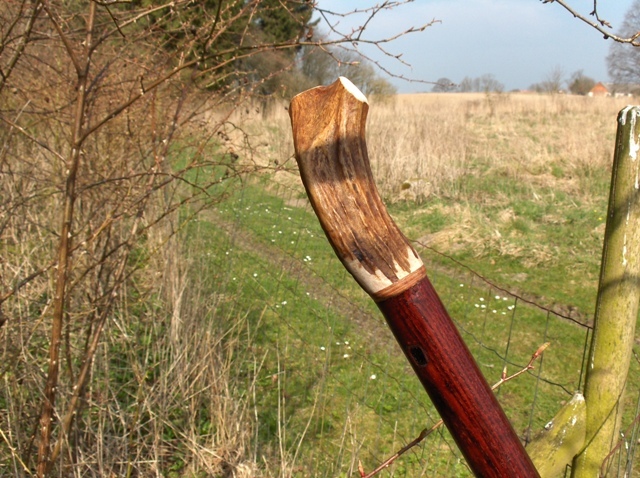 Should you desire a more traditionel monopod rifle stick, we can make you one as a special order. 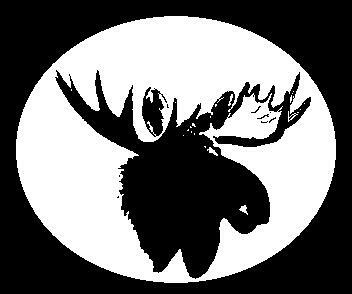 Perhaps you have an antler from a roe deer, a stag or a moose you wish to have mounted on the top of the stick? 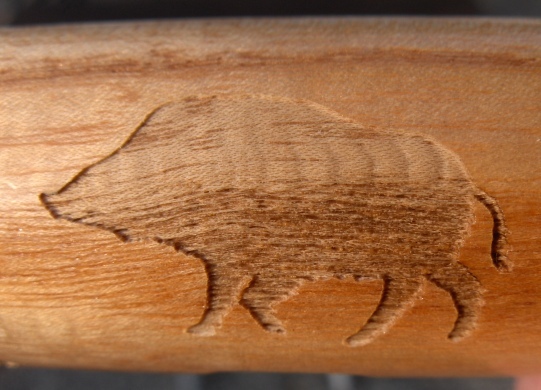 Monopod rifle stick made of ash, Mahogani no. 83, with a piece of a moose antler. The stick is specially made for the use together with a pair of binoculars. 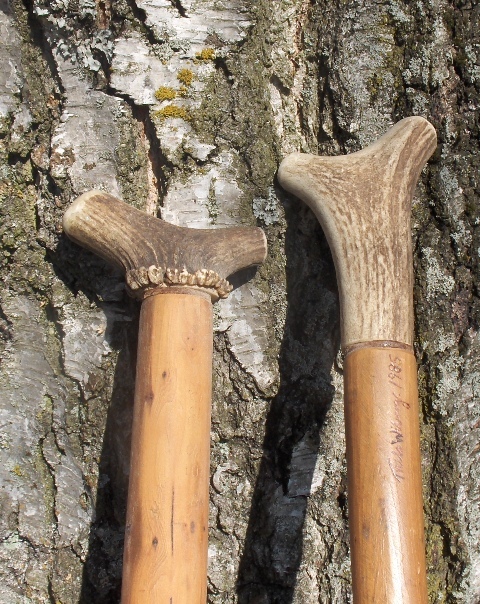 Older rifle stick's made of yaw with different cutting of the antler. 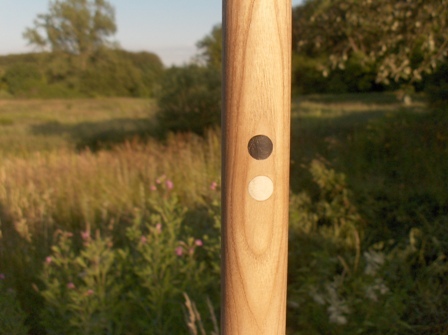 Walking stick made of heavy ash and with a small compass at the top. The decoration is sewn with birch root. For the moment we can not deliver compasses. Morta or bog oak and moose antler. Please contact us for further information on telephone or E-mail.